Getting beautiful floors that feel as good on your feet as they look takes a professional with extensive training and experience. But since you don’t have that same training, you may be a bit confused by what you’re reading when you’re investigating your flooring options. Your garage floors will take a beating from automobile traffic, lawn equipment, power tools and more. A coating with abrasion resistance will resist this wear and tear over time. Your flooring professional will also refer to the “abrasion resistance” of a coating as one of its properties, indicating how likely it is to resist this wear. An accelerator speeds the time that a coating system takes to cure. A small amount of the accelerator is added to the coating mix, so it does not inhibit the look or performance of the finished product. Accelerators are used when the floors need to be used in a short amount of time, such as when used by a business. Adhesion refers to how well the coating attaches to the floor. If adhesion is not good, the coating can wear away and leave the floors vulnerable. Aggregate consists of small pieces of stone, gravel or other material. It is mixed with concrete to make the material stronger. Ambient temperature refers to the temperature of an environment, such as the room where the floor coating will be installed. The ambient temperature will have an impact on how quickly the coating cures, how it performs, and more. If a coating does not properly adhere to a floor, it can create a visible bubble, which is called blistering. The coating actually lifts away from the floor where the adhesion is lost. Not only does this detract from the look of the floors, but it also poses safety issues. Bonding is another term for adhesion. Bonding refers to how well the coating sticks to the floor or substrate. If air is trapped between the coating and the floor, bubbling can occur. Bubbling can be either temporary or permanent, depending on whether air or other vapors or trapped and depending on what caused it. Cementitious coatings have Portland cement attached to them by a binder. These coatings have a unique look, and they are more durable. Chemical resistance refers to how well a coating can withstand damage from acids, solvents and other materials. It is especially important to know the chemical resistance of garage floor coatings since this area is exposed to oil, gas and other fluids from your automobiles. A coating system includes several layers of floor coatings, applied individually and at different times to account for their curing needs. A completed job requires a coating system, rather than a single coat. Corrosion can include deterioration, decay or oxidization of a coating system. This damage is caused by interaction with the environment, such as foot traffic or contact with equipment. Cracking occurs when a floor coating splits, usually as a result of aging. Cracking must be addressed in order to preserve the integrity of the floor. Grease, oil and other contaminants can interfere with a coating’s ability to bind with the floor or substrate. A degreaser is used to remove these contaminants and to prepare the floor for the coating system. Delaminating occurs when layers of a coating system separate because of poor adhesion. Proper binding between layers is just as important as binding between the coating and the floor. Drying time is how long a coating needs to fully harden, or cure. The proper drying time must be allowed before applying additional coats or using the floor or else the coating system can fail. If you ever have questions about the information you read or hear about epoxy floors, the friendly professionals at Barefoot Surfaces are ready to help you. 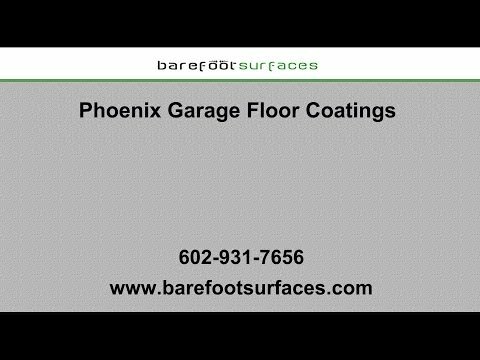 We perform garage remodels and concrete floor finishes for homes and businesses in Arizona. It is our goal to help you understand the benefits of epoxy floors and then to create gorgeous and durable floors that will improve the value of your property. We also install patio epoxy floor coatings in Goodyear with the help of trained contractors. For more information, contact us today.